With plans to make our shrimp and grits from some of the wonderful fresh morsels we bought on the North Carolina coast over the weekend, we ended up with just 1 pound of the delightful crustacean for this recipe, we used the other two pounds for some New Orleans Style Barbecue Shrimp the day before, so when necessity calls, invention happens! I thought, “What could I put in place of the missing 1 pound of shrimp that the recipe calls?” Sausage, and indeed I found a pound of smoked sausage in the freezer, quickly thawed it out and cut the link into small ½ inch cubes. Replacing 1 pound of shrimp with 1 pound of smoked sausage. Replacing the 2 cups of chicken stock with 1 cup shrimp and 1 cup fish stock for cooking the grits. Increased the amount of mushrooms from half-pound to a full pound. Increased the green onions to 1 cup, and dividing ¼ cup for garnish at the end. Added parmesan cheese for a garnish at the end. Here is the commentary from the original recipe. 1. 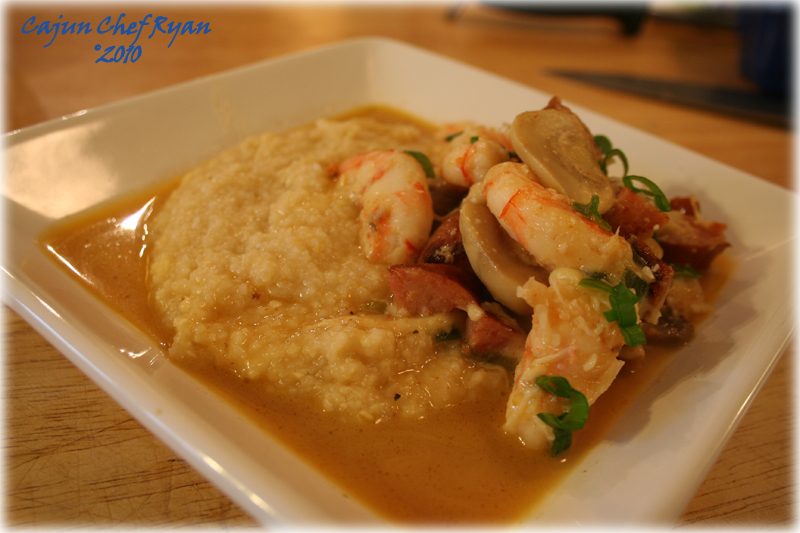 In a large saucepan, bring the seafood stocks to a boil and add the grits, stirring well. Cook until thick but still pourable, about 5 to 7 minutes. Stir in ½ of the cheese and allow it to melt into the grits well. Turn off the heat, cover, and reserve for plating. 2. Heat large sauté pan over medium high flame until hot, then add the sausage and brown well (see tip below). Stirring periodically to evenly brown the sausage. Remove from the pan and allow to drain on paper towels. Then add and melt the butter over medium-high heat and sauté the mushrooms, add 3/4 of the green onions, and garlic for 4 minutes, or until mushrooms are soft. Add the dry white wine and allow it to reduce just a bit, and then add the shrimp and the Cajun spice blend. Stir well and continue to cook until the shrimp are slightly undercooked. Then add the browned sausage back into the pan and stir well. Then fold in the remaining ½ of the shredded cheese and allow it to melt into the shrimp and sauce, stirring frequently. Garnish the top with the remaining 1/4 of the green onions and the parmesan cheese. TIP: After cutting the smoked sausage pat the cubes dry with paper towels before adding them to the pan, this helps to get them to brown quicker and evenly. Did you come my way this weekend? We were at the beaches too…eating shrimp! Amazing, no? This recipe, though, is making me so hungry. Looks very flavorful Ryan! I love my shrimp! You make me want to give grits another chance! This looks so yummy. We went to Atlantic Beach, and Emerald Isle, stayed in Havelock, NC, just about 30 minute drive. I can never get enough shrimp, the smoked sausage takes this to a whole new level. Is there any better combination than shrimp and sausage? I have never tried to experiment with grits before…this might be the push to get me going! Very nice Chef Ryan! 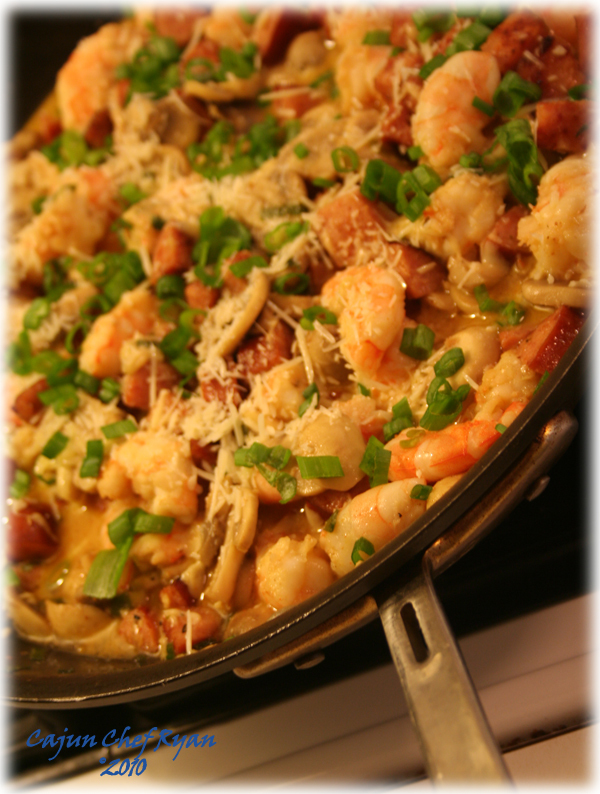 The combination of smoked sausage and shrimp is one of my favorites and of course, this southern G.R.I.T.S. gal sure loves her grits!! Prawns and sausages… it is a great combo. Love it on pasta too. Oh my, what a fantastic recipe. All of the flavors in here, along with the sausage and shrimp make this so tempting. 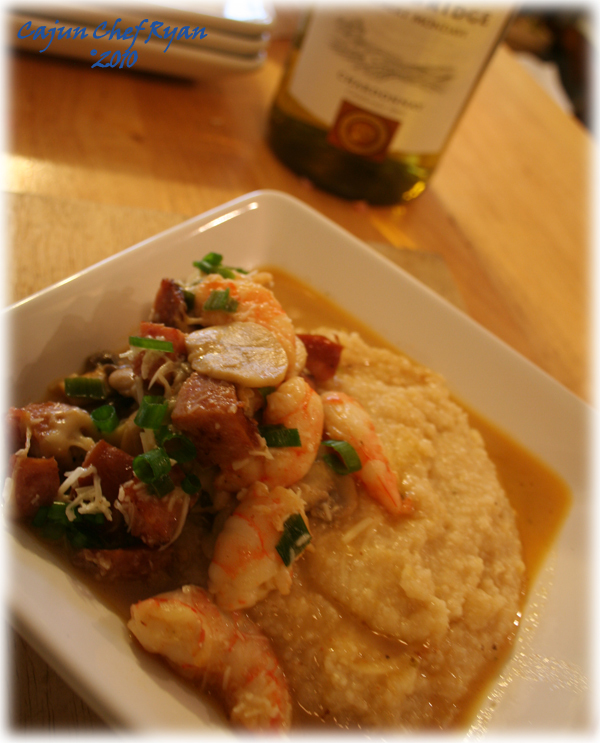 love shrimp n grits, adding the sausage is a plus – this one looks like it’s tempting me right now…. 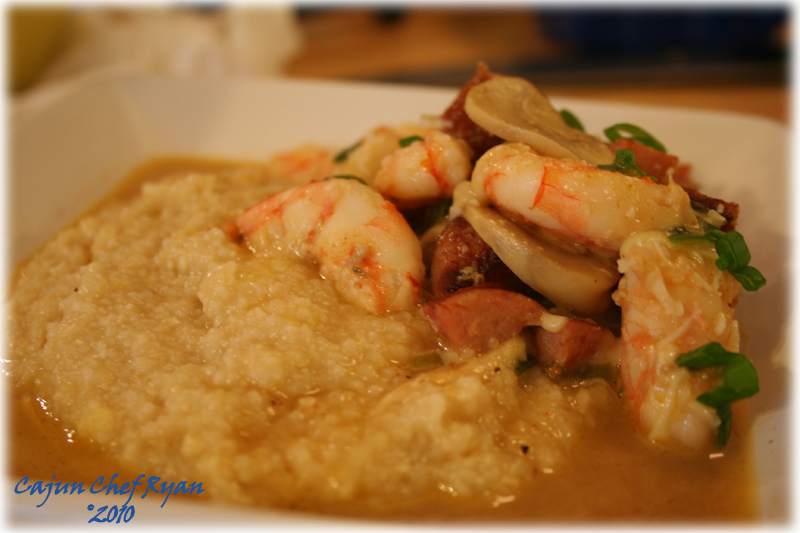 OMG this looks so good……I will make this for sure although I may end up having to make quinoa on the side as I know the guys here will not eat grits, but the shrimp and sausage flavor will still shine. Looks like a winner, Chef! Hi CCR – the first one was great, but this recipe takes it over the top!